It is not uncommon for women to own a slew of makeup. From mascaras to eyeshadows and everything in between, it can seem difficult to keep cosmetics organized. Of course, a makeup organizer can assist with that. When seeking out the best cosmetic organizer, you want to look for something that offers plenty of room for all your ultimate luxury items. Cosmetics organizers can ensure that all your favorite brands are easy to find in one pretty package. When it comes to the makeup itself, consider the use of natural, organic cosmetics. Aside from the fact that they are better for the environment and wildlife, they are also better for your skin. 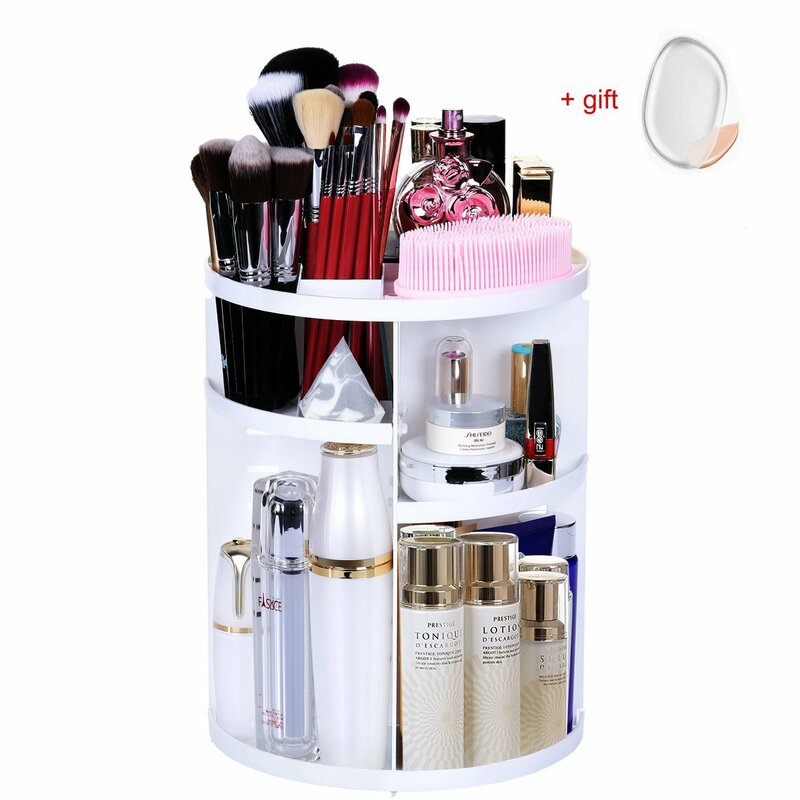 If you are seeking out a suitable makeup organizer, the ones listed below should give you some ideas. The chemistry of makeup is truly amazing. Chemists all over the world experiment with new ways to make organic beauty products that are eco-friendly and natural. These special bio beauty products deserve a special, luxurious place in your house. So check out these options you have for organic makeup storage. The Acrylic Kardashian Large Beauty Cube offers functionality and convenience. 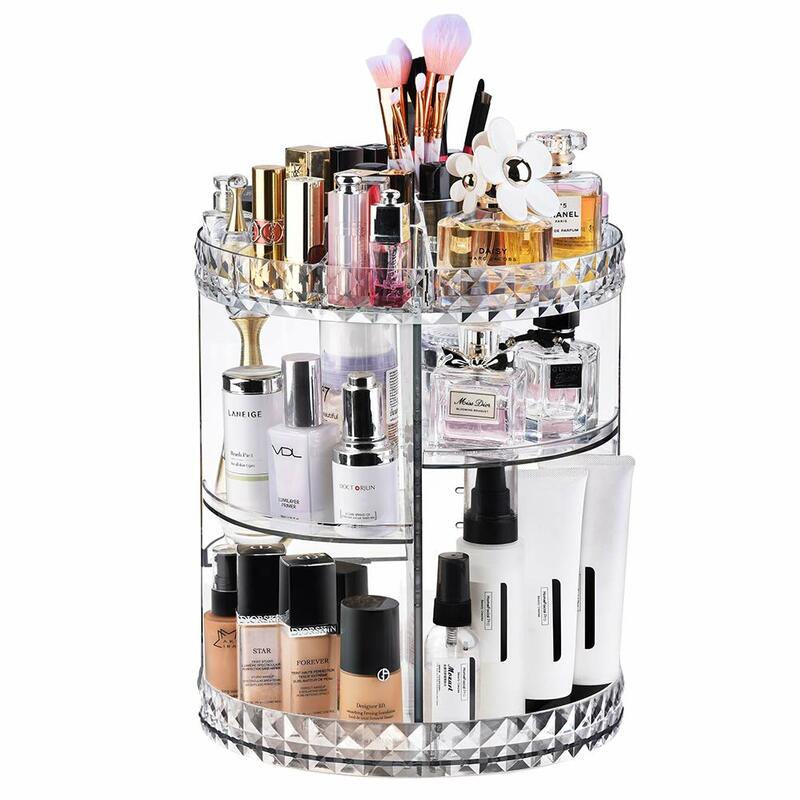 The clear acrylic material offers the high-end look of glass while the drawers keep all your favorite cosmetics neatly organized thanks to plenty of drawer space. Set this beauty cube on top of your desk and push it against your wall for an elegant appearance. You can fit a lot of larger makeup products in these small drawers like organic foundations or lipsticks. The Makeup Train Case offers durability and plenty of space that you can carry with you thanks to a secure shoulder strap. Lay out your assortment of makeup in a neat fashion thanks to the roomy tray, making it easier for you to find the cosmetics you want and need. You can store your organic foundations, like this Australian MOCHA Foundation, or smaller items like these organic lipsticks. The Acrylic Bamboo Brush Holder Organizer features a sleek outer design with its leather exterior. A drawer at the bottom offers storage for your smaller brushes or cosmetics while three inside compartments offer plenty of space for all your brushes. When you are getting ready to leave your home for work or a date night out, you typically do not have time to search endlessly for the right makeup brush. Either the wood or mirrored storage container offers a great solution. You can easily find the brushes you need when you are in a rush, which means less time spent frustratingly searching for what you need. The transparent case offers a simple, crystal clear design and plenty of compartments for lipstick organization. The wooden stand offers enough room for a dozen tubes of lipstick or it can house your favorite makeup brushes, eye, lip, and brow pencils, or your mascaras. You can easily display the label of your products in order for you to sort through your cosmetics a lot easier. This product is great for holding your Afterglow Cosmetic lipsticks. This lipstick holder can also hold your Ecco Bella or Lori Greiner mascaras. This deluxe Nail Polish Rack is a simple rack that features 6 rows, each of which holds 17 bottles of nail polish or a total of 102 bottles. From your China Glaze to your favorite color of OPI, you will never have to frantically search for your favorite nail polish again. Another option is the Clear 6 Layered Nail Polish Desk Stand, which holds 60 bottles of nail polish. The Revolving Shelf Display is available for purchase online and houses all your organic cosmetics, skincare products, and acne treatment products, like Dr. Hauschka skincare line. (P.S. if you’re prone to acne check out our organic mineral makeup for acne prone skin or our makeup suggestions for oily skin!) The countertop display provides the convenience of spinning through your assortment of goods, so they are easy to find. The rotating stand helps keep your bathroom organized, so you do not have to worry about clutter on your bathroom counters. This storage tower is great to store your organic and cruelty-free Lush products or your wholesale organic beauty products. Your hand-crafted, Lush brand beauty products deserve a private little place to live, and this manufacturer came up with a great layout just for that! Bags like the Waterproof Travel Bag are also ideal for bathroom storage. Their waterproof lining keeps your organic cosmetics safe from water damage. You can choose to travel in style or use it for bathroom storage. The drawstring makes it perfect for a travel-on storage. Fortunately, cosmetic bags like this one are often relatively cheap, too. This case can fit mini and bigger cosmetics. The drawstring allows you to hang this travel carry on bag on walls, or over doors. Each of the storage units mentioned can help keep you organized. Free yourself from the stress of finding your favorite organics and other makeup products when you choose to buy one of these organizers. Each one offers enough compartments, so DIY decluttering is a cinch. Remember to pair your organizers with organic makeups that contain all-natural ingredients that are safe for your skin. Luckily all of these products ship all over the world like Los Angeles, USA, Malaysia, the Philippines, Melbourne, Australia Ireland, India, UK, and Toronto, Canada. Yay! Beauty products for everyone! Your USDA approved organic makeup products now have a luxurious place to be housed. All-natural makeup does not contain parabens, artificial dyes, and harsh chemicals that often cause adverse skin reactions. You want to avoid putting a harmful chemical on your face at all times. Cruelty-free makeup is always the way to go. Although many all-natural cosmetics are affordable, that does not mean they are cheap. Therefore, you should do your best to organize and protect your makeup as best you can with any of the organizers mentioned above. Any idea on how to clean these organizers? I’ve ruined my older acrylic one trying to clean it with Windex.